With Zultys Outlook Communicator your Zultys IP phone system can be closely integrated with Microsoft Outlook™. You have full call control and can phone your contacts directly from Outlook. This product conveniently synchronizes Presence with your Outlook calendar, allowing it to be changed directly from Outlook. These features bring tighter integration between the Zultys UC platform and the Microsoft messaging platform. As a certified Microsoft Partner, Zultys has designed Zultys Outlook Communicator to provide Outlook users with core Unified Com­munications functions that operate directly and seamlessly from within the Outlook application. Zultys Outlook Communicator en­ables users to make, receive, transfer and disconnect calls through the Zultys Unified Communications solution as well as automatical­ly obtain callers’ contact information in a pop-up window. Addition­ally, Zultys Outlook Communicator can be set-up to automatically open a Microsoft Outlook journal window at the conclusion of your call to document it. Microsoft Outlook users can also have Zultys MX system voicemails and faxes be sent directly to their Inbox. You can drag and drop faxes, voicemails and call recordings from the MXIE voicemail panel into the Outlook Inbox to instantly attach them to messages. Enable powerful message escalation rules to guarantee that critical voice­mails and faxes are always received. Additionally, synchronize your Outlook calendar with the Zultys MXIE™ Client’s Presence status to have your MXmeeting™ events appear within Outlook and generate screen pop reminders and automatic Presence status changes. 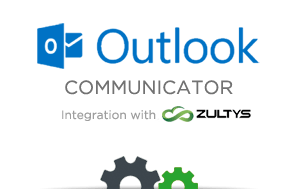 Enhanced features of Zultys Outlook Communicator are compatible with Zultys Integrated Contact Center solution. Users can log into Outlook Communicator under multiple contact center groups simultaneously. They can also choose to make outbound calls from any of the roles they are cur­rently login as with a single click of a button. The Zultys Outlook Communicator unifies corporate voice communications and Microsoft Outlook into a simple, intuitive, collaborative system that boosts productivity and improves call handling and customer service. Users can execute calls and have full call control from within Outlook, change their Presence directly from Outlook as well as synchronize it with their Outlook calendar. Zultys Outlook Communicator is a standards-based thin-client application that is easy to install and use. You can integrate powerful IP telephony features, such as call control and voice, within your Microsoft Outlook system to enable your team members to stay conveniently connected regardless of their location. Zultys Outlook Communicator allows you to boost productivity and enhance customer service with the powerful Zultys UC collaboration tools like voice, video and conferencing while retaining the familiar functions and interface of Microsoft Outlook. Copyright © 2019 One Call Telecom. All rights reserved.